Wishing you could take your band from the basement to the public arena? While these venues may not be Madison Square Garden, and you may not be the next U2, a few bars in the DC area are offering you and your friends the chance to show off your serious skills. The catch? It's all through the popular video game Rock Band. 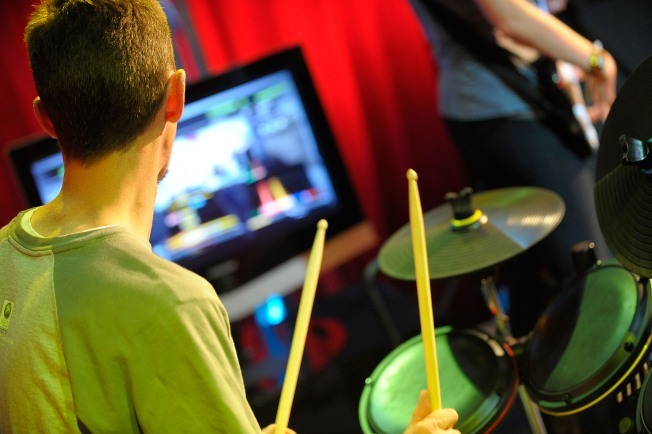 For those unfamiliar with the game, Rock Band is a multiplayer game, where three to four players take a shot at either guitar, drums, vocals or bass. They perform on instrument-shaped controllers at the same time, and attempt to rock 'n' roll their way through popular songs by matching up their playing with the colors that scroll by onscreen. While it may seem confusing at first, most pick up the basics of the game quickly. The rest resign themselves to effort over accuracy, and end up laughing their way through most of the song. Bars have been quick to cash in on Rock Band's popularity, because if there's one thing that karaoke proves, nothing goes better with potential embarassment than alcohol. Throw in a little competition, and you've got the perfect recipe for a night of endless entertainment. Whitlows on Wilson, in Clarendon, Va, hosts a Tuesday Rock Band night, which has become increasingly popular with the game's message board crowds. From 9 - 11 p.m., Rock Band reigns supreme on their X-Box console. The night starts off with freeplay, and then more serious gamers, or anyone with a competitive edge, can register their band for 2-song set in the band vs. band competition. Due to the internet buzz and management's genuine interest in offering a quality experience, Whitlow's continues to be the best bet for anyone looking to live out their inner rock star fantasies. Adams Morgan bar The Reef has also gotten into the game, with Rock Band every 1st and 3rd tuesday of the month, from approximately 9 p.m. - 2 a.m. Their Tuesday night Rock Band offering has taken longer to gather the steam neccessary to propel into a full-fledged rock night. The crowd is largely comprised of people just looking to have a good time, not serious gamers hoping to showcase their talents. But ever since they made the switch from PS3 to X-Box and fixed some lag time issues, The Reef has started to draw more of a crowd and garnered some serious interest. Other bars, like Stetson's, on U Street, and McFadden's, near GW, have also tried their hand at Rock Band nights. With the increasing popularity of the game, other bars are likely to catch on to the trend too. But like the lives of so many rockers, the careers of these virtual musicians may be cut short, whether by the pressures of life outside the limelight or general boredom. Only time will tell if Rock Band nights will continue to flourish, like high school dreams of musical stardom, or if they'll dwindle as gamers begin to realize that high scores don't translate into real-world musical success.